Biscuits or so much better hot and fresh. But many recipes make anywhere from 8 to 16, way too many for this 2 person household. In a small bowl, combine the flour, baking powder and salt; cut in shortening until mixture resembles coarse crumbs. Sprinkle the milk over the flour mixture and stir with a fork until it comes together and forms a ball. Lightly flour a surface ( your counter top works just fine here or a wood board) and gently squish it together until all the flour is mixed in. Yes, squish is a technical term. Pat the dough with your hands into a 1/2-in. thick square or round. If you make it a square then you can take a sharp knife and cut into four squares and you’re done. But if you want a traditional look, pat into a round circle 1/2″ thick and cut with a 2-1/2-in. biscuit cutter. Place on parchment paper lined baking sheet. 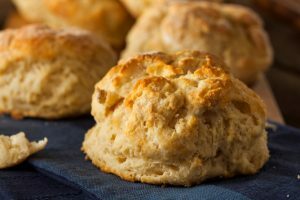 Brush the tops with 1 tablespoon butter. Bake at 450° for 9-11 minutes or until golden brown. Brush with remaining butter. Serve warm. Here’s a video on cutting in butter or shortening in case you need a refresher. Now, you may be thinking that sounds like a lot of work for only a few biscuits. since you have all the ingredients out anyway, here’s what I do to make my own Gluten Free ready to mixes. Get out a bunch of bowls, 5 or 6, and set them on your counter. Measure out all the dry ingredients into each bowl ( the flour, baking powder and salt). Now pour that into quart size zip-type bags or you can use small plastic containers with tight fitting lids. It all depends on what storage space you have. The bags take up less room but are floppy, so you have to put them into a container. The plastic containers will stack well but take up more room. I will let you decide. Label and put a “Use by” date that is 3 months out. I also print out the recipe and place it with the bags ( I use bags) so I have it handy and don’t have to go searching for it later. Viola! All done. 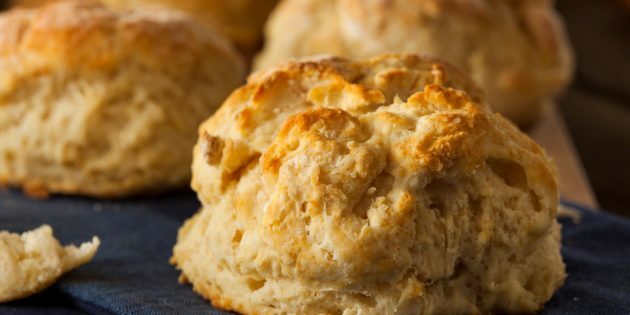 Now just add the rest of the ingredients and it’s just a hop,skip, and a jump to fresh biscuits. Now get out some homemade jam and eat those up! Thanks for coming! If you click on any of the links on this blog or this page I will receive a small stipend for it. Thanks for supporting my blog this way. It’s greatly appreciated. Why is it when I find a recipe like this that I could really use there is no way to save or print it. Doesn.t do me any good if I can’t print it so I can actually use it. If you click the right side button on your mouse and select “Print” it will allow you to print out the page with the recipe. Hope this helps. Leftclick and drag to highlight just the recipe (with picture if you like). Then rightclick anywhere and select print. In the print setup select “selection” (if you don’t see this then look for and select “Print using system dialog”). In there look for “selection”. When you print you will only get what you asked for. Once you do this once or twice you’ll have it down. And you’ll end up using it a lot – just to avoid printing all the ads and junk that are part of every webpage nowadays. If you’re using an I pad or iPhone you can just take a screen shot of the recipe and it’ll be in your pictures for later. If your using an iPhone or an iPad like I do you can just take a screen shot of the recipe and it’ll be in your pictures for later use. You can also highlight the area you want to print then copy and paste to something like a word doc, then print. What type of gluten free flour do you use? I usually use either Bob’s Red Mill 1 to 1 Baking flour blend or King Arthur’s gluten free Measure for Measure flour blend. I just find it easier to use these. That and I own a home flour mill that I can grind grains and beans in small quantities for when I have time to do that. It tastes so good and is very easy to do. I these look delicious! I’ve made these twice: once with Pillsbury GF All-Purpose Glour and Namaste GF 1-1 Blend. Both times they have turned out like flat pieces of “bread”. New baking powder even…any suggestions? Try this: mix up the dough, then portion out into muffin cups. Let them sit for about 15 minutes and then bake in the muffin cups. That should give the structure they need to rise up instead of out. And if you need to, add another 1/2 tsp. baking powder to the dough. Let me know if this does the trick.